DNA Science has confounded the Christian evangelicals by proving conclusively that most of the people in the nation of Israel and in World Jewry are not the descendants of Abraham. Abraham, Solomon and David: Romantic Nonsense? 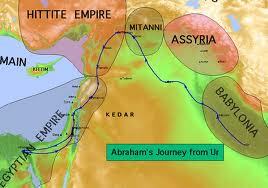 Historians date Abraham’s bibilical story around 2000 B.C., based on clues in Genesis Chapters 11 through 25. Considered the first of the biblical patriarchs, Abraham’s life history encompasses a journey starts that in a place called Ur. In Abraham’s time, Ur was one of the great city-states in Sumer, a part of the Fertile Crescentlocated from the Tigris and Euphrates Rivers in Iraq to the Nile in Egypt. Historians call this era from 3000 to 2000 B.C. “the dawn of civilization” . It turns out that Abraham in the Bible is undoubtedly just a story. Abraham in the Bible: Promotion of lands surrounding and now occupied by Israel began a long time ago in the Old Testament. The Judean scribes did their writing in about 700 BCE, referring to happenings that supposedly existed more than about a thousand years prior to when they were writing. Abraham has all the trappings of being just a made-up story. “With a sleight of hand – the one holding the pen – a new history, a new beginning was invented. And to ensure that no one dared to question its authenticity, we are told that God himself had guided this hand. Fear turned the lie into unquestionable truth. The answer is, of course, straightforward: rather than true and accurate eyewitness accounts of history, carefully passed down through the generations, the stories were just vague tribal myths and legends, eventually cobbled together by politically-motivated priests and scribes who were entirely ignorant of any real historical knowledge. Christian Biblical scholars still insist upon the Bible’s historical authenticity, even pointing out that it is the accurate historical details in the stories which prove that they are genuine: an odd claim when the Bible is so full of his historical inaccuracies. Surely, if the proof is in the detail, then inaccurate detail will undermine the whole foundation. We find such an example of this small detail in Genesis 24, that talks of camels being taken through Mesopotamia; women, children and servants riding on camels and indeed, camels repeatedly crop up in the patriarchal stories. Yet we find that camels were supposedly, first domesticated at least 200 years after Abraham’s time and they were not used it all as beast of burden until about 1000 years later. Excavations of camel bones indicate that camels were used extensively in the seventh century BCE and became a common site around the Middle East, including Palestine. The camel became a preferred means of transport just around the time when the first biblical stories were compiled. Did the Great Empire of Solomon ever exist? “If the great empire never existed, what of the great building programme undertaken by Solomon, surely this would support the biblical claims. The problem is, that modern archaeology has failed to find any great structures that might have been built by Solomon. In the past, the opposite was the case: early archaeologists hoping to prove the Bible to be true looked for anything that would confirm it, even if they were fairly liberal with the actual dating. …..Now we have the problem of Jerusalem itself – the capital of the great Solomonic empire. We are given the image of Jerusalem as a place of the impressive grandeur , having a magnificent Temple and a great gleaming palace to house Solomon’s 700 wives and 300 concubines, all protected behind huge stone fortress walls – a glorious fabled city which reflected the glory of God. Alas, it is all romantic nonsense. Despite extensive excavations, archaeologists have failed to locate any signs at all that there was ever a Solomon temple, or palace, or great fortifications…. The harsh truth is, that both David and Solomon – if indeed they actually existed, which we must doubt since there is no contemporary evidence to support that they did – would have been little more than tribal chiefs. Considering the poverty of the region and its historical reputation for banditry both David and Solomon nestling in their remote hilltop village, could well have been bandit chieftains. There is no real evidence to confirm that either of these two kings actually existed, but what we do have is legend, which came about following the story’s vigorous promotion by the later Judean state. How about this: There is no evidence for the existence of Moses. Although he is portrayed as an influential member of the Egyptian royal household, he is not mentioned in any Egyptian record. Nor is there any evidence to support the idea that the Jews were ever held captive in Egypt or that they made an exodus from the country under Moses’ command. The Egyptians chronicled their history in great detail but make no mention of any captive Jews. Amongst the hundreds of thousands of Egyptian monumental inscriptions, tomb inscriptions and papyri, there is complete silence about the ‘600,000 men on foot, besides women and children’ who The Book of Exodus tells us escaped from Pharaoh’s armies. The story of Moses, with its many miracles, has all the hallmarks of a myth. The account of Moses’ birth is a retelling of the myth of the birth of Sargon the Great, the king of Akkad, which is known in a number of variations from the early sixth century BCE. Like Moses, the child Sargon is ‘set in a basket of rushes’ and ‘cast into the river’, from which he is later rescued by an influential woman. Similar Greek stories tell of the child Dionysus confined in a chest and thrown into the river Nile. These probably all go back to Egyptian stories which tell of Osiris confined in a chest and thrown in the Nile. Israeli archaeologist Ze’ev Herzog(1) provides a controversial consensus view on the historicity of the Exodus and some other parts of the Hebrew myth. In 1999, Haaretz weekly magazine cover page article “Deconstructing the walls of Jericho” attracted considerable public attention and debates. In this article Herzog claims that “the Israelites were never in Egypt, did not wander in the desert, did not conquer the land in a military campaign and did not pass it on to the 12 tribes of Israel. Ze’ev Herzog (born 1941) is an Israeli archeologist, professor of archaeology at The Department of Archaeology and Ancient Near Eastern Cultures at Tel Aviv University.